The following are common insurance coverages most social service and non-profit organizations carry. Contact us today so we may evaluate your insurance needs! Insurance should be viewed as part of your risk management program. There is no single insurance policy that will address every risk within your organization. Consult with your attorney. Policies available as stand-alone or as part of another liability policy. Note that you are sharing your liability limits with any “Additional Insured”. Make sure that you carry high enough limits to protect your organization. Make sure that your liability policy is in compliance with your lease and other contracts. Have your attorney review your insurance coverages for compliance. Special Events should be reported to your insurance broker. If you are selling or serving alcohol, make sure to discuss liquor liability coverage with your insurance broker. Most Special Event coverages do not insure independent contractors. All independent contractors (i.e. caterers, entertainment, security, etc.) must provide your organization with proof of their liability insurance and add your organization as an additional insured. Note that many insurance carriers will not insure trampolines or Bounce Houses. Therefore, make sure the vendor provides your organization with the appropriate liability coverage. Be prepared for a catastrophic liability loss with a commercial umbrella policy. Discuss with your attorney the appropriate liability limits to protect your organization. If possible, see if the umbrella carrier will also include coverage for your Business Automobile, Non Owned Automobile, Employee Benefits Liability, Professional Liability and Abuse & Molestation Coverage. Most standard General Liability policies will exclude Abuse & Molestation coverage. Many specialty insurance programs will provide Abuse & Molestation coverage as a separate policy or in combination with your liability or business package. There is no “standard” insurance form. We recommend that organizations providing counseling/mentoring services or working with seniors, youth or the developmental disabled should carry Abuse & Molestation Coverage. Discuss this coverage and exposure with your attorney. EPLI protects against employee related allegations for discrimination, wrongful termination, harassment and failure to hire or promote. 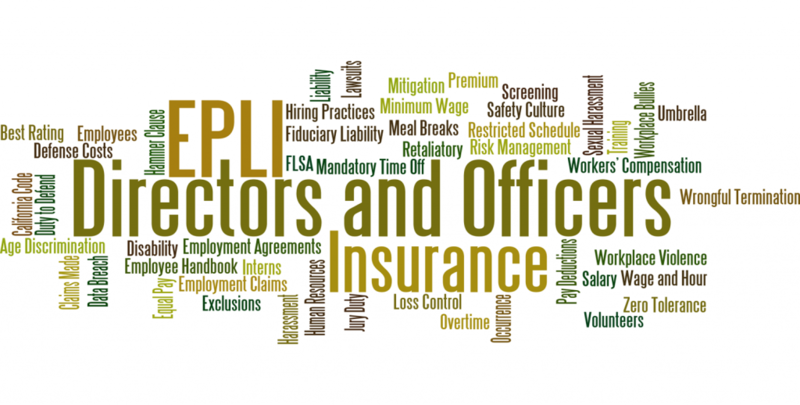 Broad Employment Practices Liability coverage. Nonprofits should protect their board of directors against D&O, EPLI and Fiduciary Liability claims.. Be prepared!